Want to add multiple image galleries in your WordPress posts and pages? While WordPress handles images beautifully, the default image galleries lack certain features. 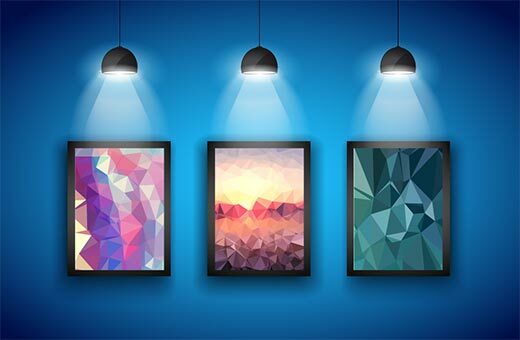 In this article, we will show you how to add multiple galleries in your WordPress posts, pages and sidebar. 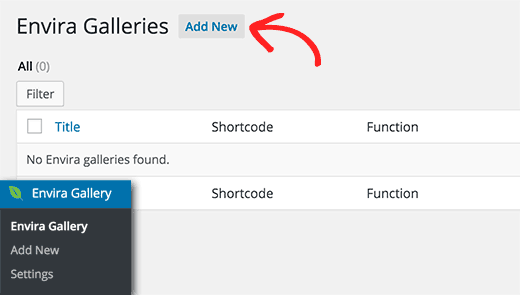 Why and Who Needs to Add Multiple Galleries in WordPress? WordPress is used by thousands of photographers, artists, and designers who use it to share their work with the world. It is also used by thousands of websites where images and photo galleries make most of the content. These websites need to add galleries in many different ways. Like adding multiple galleries in a single post, adding galleries into sidebars, creating slideshows, and so on. WordPress comes with a built-in gallery feature. You can use it to even add multiple image galleries. However, these image galleries lack functionality like opening images in a lightbox, browsing images without leaving the page, adding tags, creating albums, etc. Most importantly, your galleries are not stored separately. If you want to reuse a gallery in some other post, then you will need to recreate it all over again. Having said that, let’s take a look at the best way to add multiple galleries in WordPress posts and pages. We will be using Envira Gallery for this tutorial. 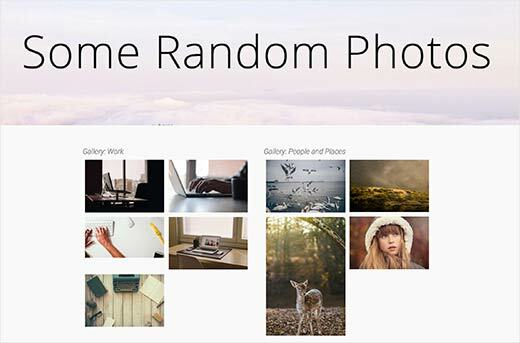 It is a premium WordPress gallery plugin that allows you to create beautiful image galleries in your WordPress site. With Envira Gallery, your users can view your images in a lightbox popup. They can browse images without leaving the page, and you can reuse your galleries in other posts and pages. It is incredibly fast and comes with ready to use templates for your galleries. Upon activation, you need to visit Envira Gallery » Settings page. There you need to enter your license key. 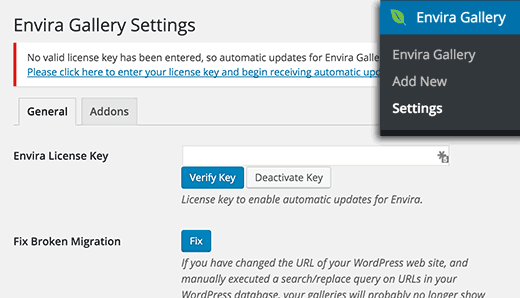 You can find your license key in your account dashboard on Envira Gallery website. After verifying your license key, you need to click on Envira Gallery which will take you to the galleries list. It will be empty since you haven’t created a gallery yet, so go ahead and click on the Add New button to add your first gallery. You will be taken to the add new Envira Gallery page. First you need to provide a title for your gallery, and after that you need to click on select files button to upload your gallery images. After uploading your images, you can click on the Publish button to save your gallery. This will make it available to be used in your WordPress posts or pages. 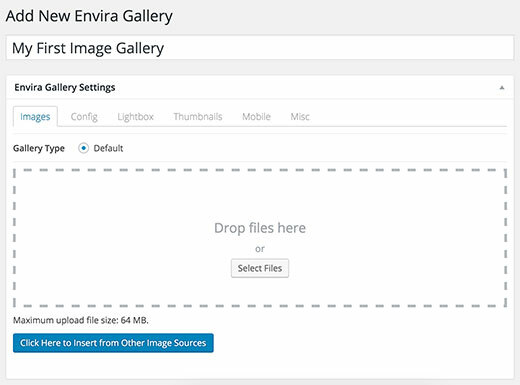 For more detailed instructions, take a look at our guide on how to easily create responsive image galleries in WordPress with Envira Gallery. Repeat the process to create another image gallery. You can create as many image galleries with Envira Gallery as you want. Adding galleries into your WordPress posts and pages is very easy with Envira Gallery. Create a new WordPress post or edit an existing one. On the post edit screen, you will notice a new button labeled “Add Gallery” above the editor. Clicking on the Envira Gallery button will bring up a popup. This popup will have the galleries you created earlier. Simply click on a gallery that you want to add and then click on the insert gallery button. Now you can click on the Envira Gallery button again to select another gallery. You can add as many galleries as you want. Once you are done, you can simply publish your post or page. Finally, visit your website, and you will see multiple galleries beautifully displayed on your website. Envira Gallery makes it super easy to add your galleries into sidebars and other widget ready areas. You need to go to Appearance » Widgets page. There you will notice the Envira Gallery widget under other available widgets. 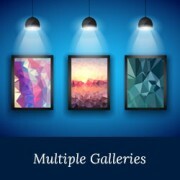 Add Envira Gallery widget to the sidebar where you want to display your gallery. From the widget settings select the gallery you want to add. Don’t forget to click on the save button to store your widget settings. Repeat the process to add another Envira Gallery widget if you want. Visit your website when you are done to see multiple image galleries beautifully displayed in your WordPress sidebar. We hope this article helped you add multiple galleries in WordPress posts and pages. 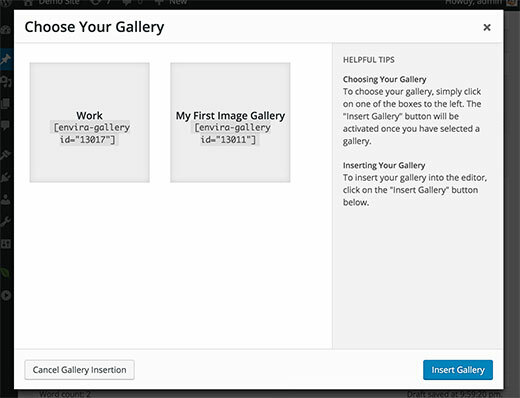 You may also want to see our guide on how to create a photo gallery with albums in WordPress. Our Featured Artists must be in alphabetical order so listeners can find them and because we are constantly adding new artists, I need to be able to place new artists in specific places to keep them all in alpha order. Does anyone know if building a page like this in WP is even possible?? I’m losing my patience and my marbles trying to figure this out…lol. Any help is MUCH appreciated. Thank you!! Thank you! I have been searching for a way to do this for awhile now…wordpres should really add this to the core product. Seems very simple to do without having to add yet another plugin. @wpbeginner Update- I had to disable the plug-in because it removed my ability to access any images I had previously uploaded to the site. Once I disabled it, I have full functionality back again. Not sure if it is a conflict with another plug-in or something else, will try disabling other plugins I really don’t need and see if it works then. @wpbeginner If you go to http://kittyloafdesigns.com, you’ll see one way I made this plug-in work. I had wanted a photo of myself posted next to my intro, and a small gallery below it to show some samples of my work, but without being able to separate the two, the best I could get before was to have my photo at the top, then have it appear a second time within the gallery. Now I am able to have the two apart from each other, which is great! There’s just one more thing I would like to see this plug-in do, and that would be to be able to assign images previously or later uploaded to galleries on a page, not just the ones upload with that post. Then it would be perfect! @wpbeginner I can definitely do that. We’re about to head off to bed, but this evening I’ll be installing it and making a few changes. I have one page in particular that will be able to make very good use of this plug-in. @inkdork Yea a lot of folks don’t know about this very neat feature Do show us the example once you are done. I should have dug through the archives sooner- I’ve been wondering about this for a while. Looks like I’ll be adding this to my site tonight. Interesting stuff to read & sounds great with clean implementation. Really an useful & effective informational posting for me at this time. Thanks a lot for share this nice read : ) Looks forward to hear more good stuffs from you ever . . . ! Thanks. Other solution would be to add another gallery tag manually and list picture id’s for that gallery. This is definitely one of those things that need to improve in WordPress core in future versions.